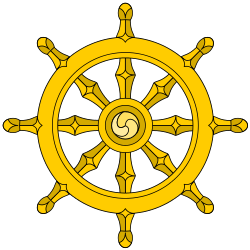 According to the Lankavatara Sutra and the schools of Chan/Zen Buddhism, the alaya-vijnana is identical with the tathagata-garbha[note 6], and is fundamentally pure. 1 2 Each being has his own one and only, formless and no-place-to-abide store-house consciousness. Our "being" is created by our own store-consciousness, according to the karma seeds stored in it. In "coming and going" we definitely do not own the "no-coming and no-going" store-house consciousness, rather we are owned by it. Just as a human image shown in a monitor can never be described as lasting for any instant, since "he" is just the production of electron currents of data stored and flow from the hard disk of the computer, so do seed-currents drain from the store-consciousness, never last from one moment to the next. ↑ In contrast to an Arhat, a Buddha is one with all his seeds stored in the eighth Seed consciousness. Cleansed and substituted, bad for good, one for one, his polluted-seeds-containing eighth consciousness (Alaya Consciousness) becomes an all-seeds-purified eighth consciousness (Pure consciousness 無垢識 ), and he becomes a Buddha. 1 2 Berzin, Alexander. "Mind and Mental Factors: the Fifty-one Types of Subsidiary Awareness". Berlin, Germany; June 2002; revised July, 2006: Study Buddhism. Retrieved 4 June 2016. Unlike the Western view of consciousness as a general faculty that can be aware of all sensory and mental objects, Buddhism differentiates six types of consciousness, each of which is specific to one sensory field or to the mental field. A primary consciousness cognizes merely the essential nature (ngo-bo) of an object, which means the category of phenomenon to which something belongs. For example, eye consciousness cognizes a sight as merely a sight. The Chittamatra schools add two more types of primary consciousness to make their list of an eightfold network of primary consciousnesses (rnam-shes tshogs-brgyad): deluded awareness (nyon-yid), alayavijnana (kun-gzhi rnam-shes, all-encompassing foundation consciousness, storehouse consciousness). Alayavijnana is an individual consciousness, not a universal one, underlying all moments of cognition. It cognizes the same objects as the cognitions it underlies, but is a nondetermining cognition of what appears to it (snang-la ma-nges-pa, inattentive cognition) and lacks clarity of its objects. It carries karmic legacies (sa-bon) and the mental impressions of memories, in the sense that both are nonstatic abstractions imputed on the alayavijnana. The continuity of an individual alayavijnana ceases with the attainment of enlightenment. 1 2 3 4 5 6 7 8 9 10 Gareth Sparham, translator; Shotaro Iida; Tsoṅ-kha-pa Blo-bzaṅ-grags-pa 1357-1419 (1993). "Introduction". Yid daṅ kun gźi'i dka' ba'i gnas rgya cher 'grel pa legs par bśad pa'i legs par bśad pa'i rgya mdzo: Ocean of Eloquence: Tsong kha pa's Commentary on the Yogācāra Doctrine of Mind (alk. paper) (in English and Tibetan) (1st ed.). Albany, NY, United States: State University of New York Press (SUNY). ISBN 0-7914-1479-5. Retrieved 6 February 2013. 1 2 3 Berzin, Alexander. "English Glossart of Buddhist Terms: 'All-encompassing Foundation Consciousness'". Berlin, Germany: The Berzin Archives. Retrieved 6 February 2013. An unspecified, nonobstructive, individual consciousness that underlies all cognition, cognizes the same objects as the cognitions it underlies, but is a nondetermining cognition of what appears to it and lacks clarity of its objects. It carries the karmic legacies of karma and the mental impressions of memories, in the sense that they are imputed on it. It is also translated as 'foundation consciousness' and, by some translators, as 'storehouse consciousness.' According to Gelug, asserted only by the Chittamatra system; according to non-Gelug, assserted by both the Chittamatra and Madhyamaka systems. ↑ Berzin, Alexander. "A Brief History of Buddhism in India before the Thirteenth-Century Invasions". Berlin, Germany; January, 2002; revised April, 2007: Study Buddhism. Retrieved 4 June 2016. The Theravada and Sarvastivada Schools each held their own fourth councils. The Theravada School held its fourth council in 83 BCE in Sri Lanka. In the face of various groups having splintered off from Theravada over differences in interpretation of Buddha words (sic. ), Maharakkhita and five hundred Theravada elders met to recite and write down Buddha’s words in order to preserve their authenticity. This was the first time Buddha’s teachings were put into written form and, in this case, they were rendered into the Pali language. This version of The Three Basket-like Collections, The Tipitaka, is commonly known as The Pali Canon. The other Hinayana Schools, however, continued to transmit the teachings in oral form. 1 2 Lusthaus, Jan. "What is and isn't Yogācāra". Archived from the original on 2013-12-16. Retrieved 12 January 2016. ↑ Muller, Charles A. (March 1995). "The Key Operative Concepts in Korean Buddhist Syncretic Philosophy: Interpenetration (通達) and Essence-Function (體用) in Wŏnhyo, Chinul and Kihwa". Bulletin of Toyo Gakuen University. pp. 33–48. Archived from the original on 28 August 2008. Retrieved 18 September 2008.